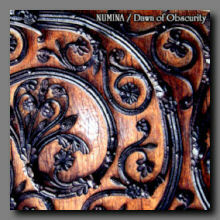 "Dawn of Obscurity" is on sale for only $13.00CAN plus $3 shipping anywhere in the world! Jesse Sola, aka Numina, returns with this stunning new release. "The Shadow of a Day" begins with a rising and falling pad, sounds echoing through the soundscape, dark and a tad ominous, but still very appealing. "Cold Shine" glistens and twinkles, space music for winter time astrological pursuits, a dense trip through the stars on the outer edges of the known galaxy. An Alien choir singing songs to doomed spacemen floating in tin cans. The Alien Choir remains for "Faces Remain" but they've evidently moved to a new location resplendent in Alien reverb. It's a beautiful track with something almost sacred to it that gives it an added appeal. A very moving piece. "Moment from the Past" follows, a spacey and beautiful piece of music that echoes the sounds of stars and nebulae. Or at least what I expect that stars and nebulae sound like. "We Will Always Be" ramps up the alien element resulting in a vaguely unsettling track where distorted voices and sounds travel through the ether, distant radio transmissions perhaps, certainly something that has been traveling through space headed for earth for thousands of years, only reaching us now. It's cool stuff, but just a touch unnerving. "Withdrawn" sizzles and flies, moving through galaxies we haven't even dreamed of yet. It's an epic piece of music, with a truly beautiful build and the creation of a sparkling new space that's never been imagined before. Moving through deep space, past lush and beautiful planetary vistas, this is an epic track that captures the quintessential Numina sound in one place. A brilliant and moving piece of music that's really quite lovely. It should be noted that while the tracks on "Dawn of Obscurity" are indexed as individual pieces, they all blend seamlessly into each other to create one long form piece with distinct movements. And in this era of randomized playlists and mixing and matching tracks, it's my suggestion that this is the best way to listen to the album, an active listen in one sitting that creates a continuous and uninterrupted journey through the musical mind of Jesse Sola. I expect you'll feel the same.